After my husband had driven me across the northern route from Virginia to Washington state, it was time to make the drive to Alaska. My father asked to come with me. Apparently, some of my family were worried about me traveling by myself (I have done this trip 4 times prior), but I agreed that it might be nice to have company. I met my father in Bellingham, Washington. 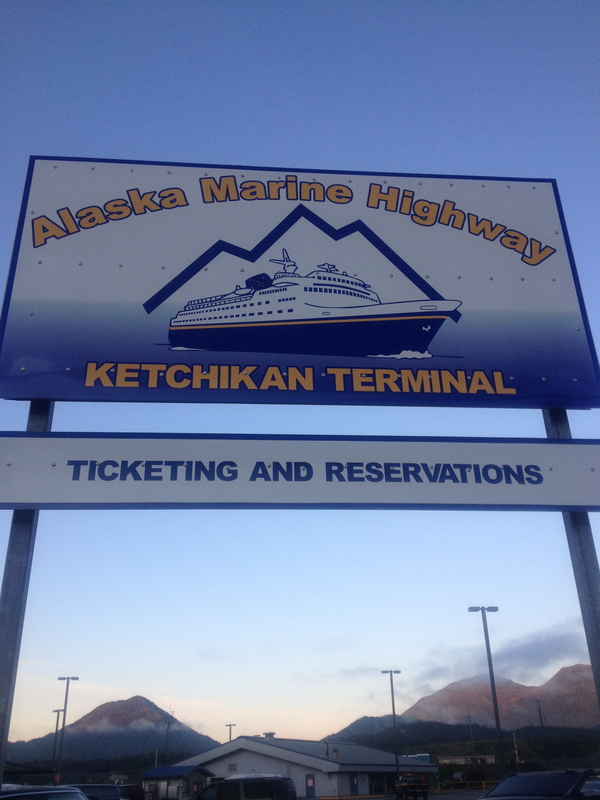 He wanted to leave his car near the Alaskan Ferry terminal, so that when he returned, he could simply walk to his car and drive home to Kingston. It was a rainy Sunday morning. I parked my car and waited for Dad to catch up with me. After a cup of coffee and a journal entry, he pulled up with his car. He parked and we drove off. About 5 blocks into our journey, he said, “Let me go back and check my car.” When we got back, he noticed that he had left his back window open. He has had these “feelings” all his life and it has saved him quite a few times. We made sure his car was okay and headed north on I-5. We pulled into Lyndon, Washington, a boarder town, and headed toward Sumas boarder crossing into Canada. About an hour into the trip on Highway 1, we stopped in the town of Hope, BC. I wanted to purchase some fruit and food for the car. The mountains surround this town, and one really feels like you are somewhere in the Alps, instead of hours north of Seattle. We turned the car north and began the twisty climb toward Prince George. My plan was to stay in a little lodge near William’s Lake, a log cabin type thing with rooms off the main lodge. We would have a seven hour drive this first leg. Once over the mountains, we ate lunch in Cache Creek (greasy hamburger and milk shakes), and continued on through the dry Okanagan country between the top of the Cascade mountains and the northern prairies. We pulled into our “lodge” about 5:30 p.m. There wasn’t anyone there. There was a note left on the front door that I could find my room on a board walk, but it was really frightening. The rooms were all unkept, and I would have been all alone on the property, if my dad wasn’t with me. As it was, there wasn’t a clean room for Dad either, so he said, “Let’s get out of here.” I always listen when Dad wants to run. We drove 20 more miles into the town of William’s Lake. We saw a Motel 8 along side the road. I didn’t want to stay there, but Dad thought it would be okay, so we checked in. His room was nicer, but for under $100, it was a find. Right next door was a very nice steak house/pub. We walked over and had a great dinner and a few beers. It was a great stop after all. Day two: we began an eight hour drive to Smithers, BC., a town on the way to Prince Rupert. The country changes after you leave William’s Lake. It goes from arid farmland to dense pine and fir trees. As you come to Prince George (half way to Smithers from William’s Lake), the land is forested and dense. Heading westward on B.C. Hwy. 16, it is about 4 hours further to Smithers. We arrived about 4 p.m. I bought a rotisserie chicken and sides at the Safeway store there and we headed out to Glacier View R.V. park and cabins. I wanted to stay within a four hour drive to Prince Repurt, as our ferry would leave 3:30 in the next afternoon, and we would we need to be in line at noon. In Smithers, we had two little log cabins, side by side. As Dad’s deck was larger with a table on it, we spread our meal out and ate dinner, watching the kids play and run through camp. The weather changed soon after dinner, and thunder storms rolled in. We said good-night and settled in for the night. It was comforting listening to the pelting rainstorm. The next day we wound our way down from the high country, through the coastal mountain range to the west coast of British Columbia. There is a wide river that runs the last 2 hours of the drive and it was beautiful. We drove straight to the ferry dock and got in line. It didn’t seem long at all until I was driving onto the Alaska State Ferry, bound for Ketchikan. My father was a logger in Southeast Alaska in 1960’s. It was here that he moved most of us to when he could, to live at a camp off of the Prince of Wales island, in Alaska. As we watched the mainland grow distant, Dad became nostalgic and he began to tell me of the loggers he worked with and how they managed through the long rainy months in a small logging camp. We spent 5 hours on the ferry, watching the waters, eating a nice meal in the cafeteria, and standing on the deck of the ship, watching the land slip by. I remember when we were talking about my new teaching position, I suddenly clasped my hands to my chest and said to him, “Dad, I’m scared!” He looked at me and said, “For a moment, you’re my little girl again, and I’ll tell you what I told you then: you are remarkable, capable and strong…I can’t wait to see what you will do!” I have a great Dad. When we hit Ketchikan, it was dark. I had booked two rooms at the Best Western in Ketchikan, directly across from the ferry landing. We ended up with the last two rooms for the night; two very large suites. We enjoyed spreading out and having time to relax. The next day, I ran around in the morning, purchasing some things for the island (good thing), and taking care of my dog at the Vet’s. After breakfast, we toured around Ship Creek area, and checked out some shops where my Dad had connections. It was a great time. Later that day, I was anxious to get in line for the ferry to Prince of Wales. My Dad was catching another ferry south back home. So, both of us were in different areas at the landing. I could see him standing in line waiting, as I was in my car ready to board. We had had a great trip, not dwelling in the past, but talking over life in general: coming to conclusions and sharing laughter. I would have to say it was one of the best times I had ever had with him. It was still sad to see him sailing away from me.